Update: Deezer is deepening the relationship it has with Google Home, now offering its coveted Hi-Fi service on the Google Home family of devices. The bolstered relationship means you can now stream music in True lossless FLAC quality at 16-Bit / 44.1 kHz, use voice commands to find and play albums, artists, playlists, tracks, genres or ask the Google Assistant to play Flow. Deezer on Google Home for HiFi and Premium+ users is also now available in four new countries – the US, Canada, Italy and Australia – joining the existing markets including UK, France and Germany. Deezer, the music streaming service that launched in France and has since expanded to nearly every corner of the world, has some pretty impressive stats. To start, it’s available in 182 countries. To put that in perspective, there are 192 countries on Earth, which means there are only 10 countries in the entire world that don’t have Deezer. So, unless you currently reside in the Vatican, Taiwan or Kosovo, this review applies to you. Now, the sheer size of the company might lead you to believe that its music library must be infinitesimally small in order to secure rights in all those countries. Well, it’s not. There are over 35 million songs on Deezer, compared to the 25 million on the Google Play Music Store or Apple Music. And, if you can’t find what you’re looking for, Deezer also lets you import your favorite MP3s. “Well then, it’s got to have the worst streaming quality in the world,” you say to yourself. And on this one you’re right – sort of. How much does Deezer cost? Deezer is offered in three tiers: an ad-supported Discovery tier, a premium version that runs $9.99/£9.99/AU$11.99 and an Elite version, essentially offers the Rolls-Royce of streaming music services, for $14.99/£14.99/AU$23.99. The lowest of the tier will stream at an unsavory 128kbps, which is about half the quality of anything on the web version of Spotify. Once you buy into the program, streaming quality steps up to 320kbps at the Premium level and, finally, you can stream hi-def CD-quality 1,411kbps, 16/44.1 kHz music once you plunk down 15 bucks a month for Elite. Here comes the confusing part: Deezer Elite isn’t available in every country, or on every device. It’s not available on your phone through the Deezer app in America, for example. However, Deezer has brought it to the States through a partnership with Sonos. Confusing, I know. So, look into which devices you own and where that falls into Deezer’s grand strategy before throwing down some dough. As a rule of thumb, though, Deezer Premium works in some capacity on almost every device. From Samsung Smart TVs to BMWs, it seems like the service is everywhere. Deezer works like your run-of-the-mill streaming service. You’ll create a login that you’ll use across all of your devices, and pick one of the umpteen platforms to start jamming out on. Premium users might find the best luck starting out with the web player or on either major smartphone platform, iOS or Android. Elite members, on the other hand, should shoot straight to their Sonos systems to check out their favorite tracks in ultra-crisp HD audio. One of the first steps to building a better experience is to highlight particular genres, artists and songs that you like by “hearting” them. Like the other streaming services out there, Sonos takes this information to … heart and uses it to find more music that it thinks you’ll like. Unfortunately, finding anything takes a bit of patience. Search isn’t perfect and far too often I found the “top tracks” section of an artist’s page anything but. Still, if you can stick through the headache of finding music, you’ll be rewarded with glorious 16bit, 44.1kHz FLAC files that are pretty much heaven on earth for music lovers. Audio is, as you might imagine, a highly complex end of the tech scene, with tons of technical jargon. Hi-def is a term that was appropriated in the last few years to mean any audio file that is sampled at either 16 or 24 bits – the amount of audio information recorded at a single moment in time – and either 44.1 or 192kHz, which is the number of times data is written per second. Both of these numbers refer to the actual tracks stored in Deezer’s massive catalog of 28 million hi-definition audio files. These files are encoded in FLAC, an uncompressed audio format, and then streamed to you at 1,411kbps. FLAC preserves more data and, in layman’s terms, sounds absolutely exceptional. After spending the last three months with Apple Music, I was sure that no service would come close to the volume of music that the Cupertino company has. I’m happy to report that I was proven wrong. Deezer has over 35 million songs, 28 million of which are available in HD. Deezer does a fantastic job of branching out to the far corners of the globe and reining in the most popular music in each area. If you’re a ’90s R&B fan but occasionally want to jam out to Latin Alternative, Deezer has you covered. Want to see what’s big in Brazil one minute and then hop the pond in either direction to see what’s new on the charts? No problem, Deezer has both Asian and African sections that seem to get frequent updates. Miraculously, Deezer even has Taylor Swift, who went on record earlier this year denouncing Spotify and the like for paying fractions of a penny for her songs. Now, that’s not to say Deezer has absolutely everything. You can’t find The Beatles here, due to an exclusive agreement between Apple and John Lennon’s estate. Nor are you be able to stream Metallica’s cataclysmically epic metal ballads for a similar reason, but that’s more or less par for the course with any of the new services that aren’t Apple owned. 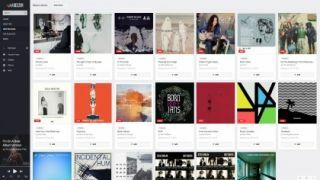 If you find a new band, album or track you’re really into, Deezer lets you save them to your music, which essentially acts like a bookmarks section of a web browser. Similar to Tidal, Spotify and Apple Music, if you really like something and subscribe to Deezer Elite or Premium, you can even download a copy to your device. Your opinion on Deezer will almost definitely depend on which app and where you access the service. The most robust option is the online player, available on any browser. It’s more functional than other sites, like Rdio and Pandora, without becoming too cluttered or presenting too much at one time. 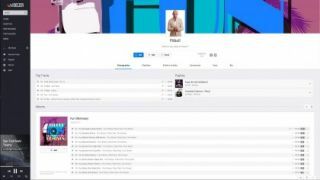 The web player compartmentalizes the five specific features of Deezer: Hear this, New Releases, Top Playlists, Mixes and My Music. Hear This, Deezer’s answer to Apple Music and Tidal’s expertly-crafted curated playlists, is best described as the marriage between a Twitter feed and Spotify’s friend list. It shows you what people you’re following are listening to and will come pre-populated with picks from Deezer’s staff. It’s usable, though not quite as populated as Spotify or Tidal. New Releases is what you might expect: a listing of all the new albums in genres that you told Deezer you like. It’s plain and simple, but it gets the job done. 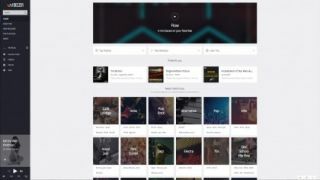 Top Playlists and Mixes are two of the more interesting features, and while they sound interchangeable, one focuses on a mood (that’s Mixes) while the other combs the community for DJ-level setlists. However, as smart and clean as the web player looks, it feels almost sterile compared to the overwhelmingly abundant Apple Music which crams every nook and cranny full of new music, undiscovered artists and information on the tunes you already know and love. Both mobile apps feel like dimmed-down versions of the web player. All of the functionality remains, but navigation feels clunky and disjointed. Trying to figure out what you’re looking at takes a second, and finding, say, a playlist to work out to burns minutes of much-needed gym time. Lastly, you’ll want to connect the app to your Sonos system if you’re lucky (or devoted) enough to own one. Once you authorize the app, you’ll be taken to a barebones version of the Deezer app with the five aforementioned features residing in the left-hand menu. Deezer inside Sonos isn’t what I’d call the optimal player, but thanks to the FLAC files, at least when everything’s said and done the one thing that matters, the music, sounds good. 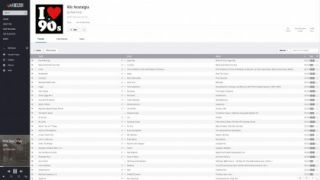 Deezer’s music catalog is impressive, as is the sheer amount of 16/44.1 kHz FLAC files at its disposal. Its integration into the Sonos system feels like a natural pairing, even if the app limits the service to a few playlists, the search and music flow functions – and your favorite songs. Flow, the Pandora-esque personalized radio station, rarely missed the mark in its recommendations even without much initial input. That said, while Tidal feels like a friendly place full of music lovers and curated content, Deezer’s homepage and apps feel somewhat lifeless. Curated playlists are either overstretched or seemingly manned by a skeleton crew. The iOS app either feels either incomplete or too obfuscated to operate. Similarly, Deezer Elite on the Sonos interface feels restricted and simplistic. Every streaming service has its strengths and weaknesses. Where Tidal seems to offer the best curated content, Spotify puts friends’ music front and center. Apple Music has the best mainstream music anywhere on the planet, while Google Play Music integrates perfectly with Android devices. 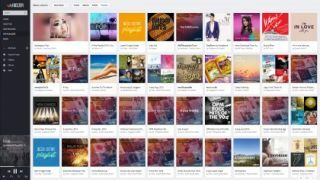 Deezer’s secret sauce is its massive, global music library and cornucopia of HD tracks. Admittedly, its apps have a ways to go to catch up to the rest of the pack, and its curated lists are severely hurting in terms of more frequent additions. But, ultimately, it’s a fine music streaming service for the globetrotting audiophile or Sonos-equipped music snob.